All Delegates All data All the insight. Experience industry leading analytics capabilities through the power of the Forum iQ portal. Analyse multiple organisations and client sources with our delegate discovery tool, view tactical research reports and shortlist clients for one to one meetings. Create compelling business cases to attend our forums backed by real live data and insights that will turn heads and get budgets approved. Forum IQ gives everyone the power to make better decisions on who to network with and transforms pre event and real time interaction. Fully searchable and interactive with real time current data on the group’s most critical business objectives. 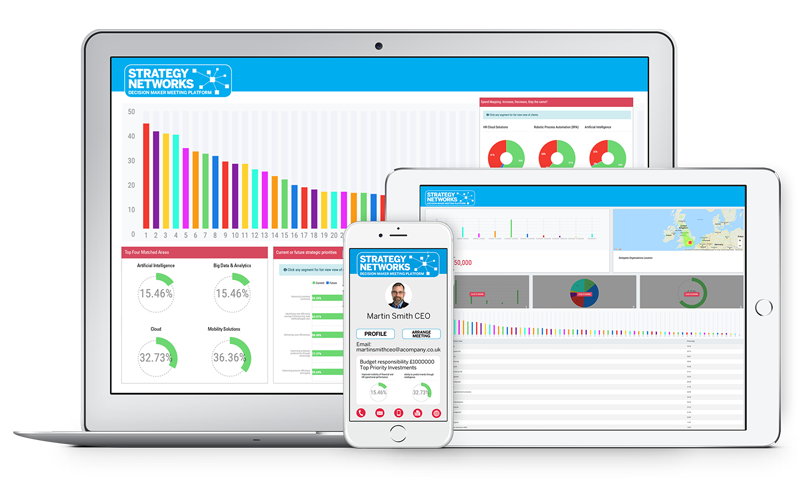 Intelligence at your fingertips matching your organisations business development strategy with the target groups top investment priorities. If you are not currently attending a forum but want to gather intelligence on the group, download industry trends and match delegates with your solutions. Register for free and create a fully intelligence backed business case to justify marketing spend. Its all point and click and you will have a professional business case in minutes backed up with proper specific analytics. Forum IQ case builder is a powerful friend. Ability to execute strategy is still a number one challenge amongst top execs. Insight into common strategic priorities, end to end data for every delegate transformed into searchable ready to use information. Click, View, Zoom, Connect – Done. The move to the digital era has resulted in organisations becoming reliant on various forms of technology to run their business. Some types of tech are industry specific. With our tech investments tool, you can see the overview and deep dive into what’s important for each delegate. Spend Mapping. Increase, Decrease, Stay the same? Global IT spend is set to grow exponentially. Industry specific tech spend is hard to predict and even harder to profile solutions to match. With spend mapping analysis you can identify where your solution fits into our top 6 pre qualified event specific categories, check if this is a growth area, and engage with your clients at the event accordingly. Shape your proposition. Big Picture matching / Solved. The combined spending power of our groups is in the billions, you can quickly see trends, where budgets are being spent and practical examples of procurement opportunities attached to financial spend. Drill down into individuals by name, job title or organisation. Budget holders uncovered, its no secret. Smart leaders understand that they need to prioritise and deliver on improvement initiatives. Smart solution vendors align their solutions to the needs of their customers. Use the improvement initiatives mapping tool to see a high level analysis of top enhancement ranges at a glance a complete deep level zoom into individual delegates if you want it. The intelligent way to book meetings. Most strategic plans are developed to sustain growth, prepare for challenges and identify efficiency gains. But who wants what and when? In todays multi layered business environment, organisations are working to different timelines and varying priorities. Can you predict future trends & investments? We can. See at a glance where delegate clients are coming from through our interactive heat maps. Got a national sales team? Not sure who to send to the forum? Take a view and allocate resourcing accordingly. Our business case builder allows you to develop a well-thought-out proposal to use internally. You can tap into our insights and data, add supporting evidence on the groups investment criteria and assess information about ROI. You can even include information around sales figures, strategies and how you plan to integrate your approach to capture more market space through harnessing our model. Our output template is fully editable.